Vancouver Native Housing Society gratefully operates on the shared unceded, ancestral and traditional territories of the Sḵwx̱wú7mesh (Squamish), xʷməθkʷəy̓əm (Musqueam), and səl̓ilwətaɁɬ (Tsleil-Waututh) Nations. Vancouver Native Housing Society is governed by an all Indigenous Board of Directors and a team of both Indigenous and non-Indigenous staff. VNHS currently operates 18 subsidized rental buildings in Vancouver’s Grandview Woodlands, Mount Pleasant and Downtown Eastside neighbourhoods. VNHS operates residential family buildings, supportive housing buildings, and one Artist in Residence program. 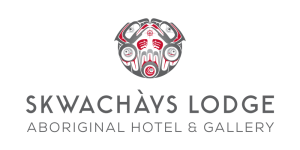 Skwachàys Lodge, Canada’s first Aboriginal arts hotel provides guests with first class services and a platform to showcase local indigenous art and culture. Eighteen one-of-a-kind guest suites designed by local Indigenous artists and Vancouver interior designers tell stunning visual stories about First Nations culture and features original artwork created by the participating artists. At street level, the Urban Aboriginal Fair Trade Gallery features Indigenous artwork which includes original paintings, framed limited edition prints, jewelry, pottery, wood carvings, giftware and so much more, purchasing most of its original work from local artist. Skwachays Lodge Hotel and Gallery is a social enterprise that provides the funding for 24 living and work studios for an ‘artist in residence’ program in our building. Owned and operated by Vancouver Native Housing Society, a non-profit registered charity governed by an all Indigenous Board of Directors, Skwachays Lodge is the CEO David Eddy’s innovative alternative to government funding for social housing.